Unauthorized Apple stores are a perennial story in many countries, and this year is no different. 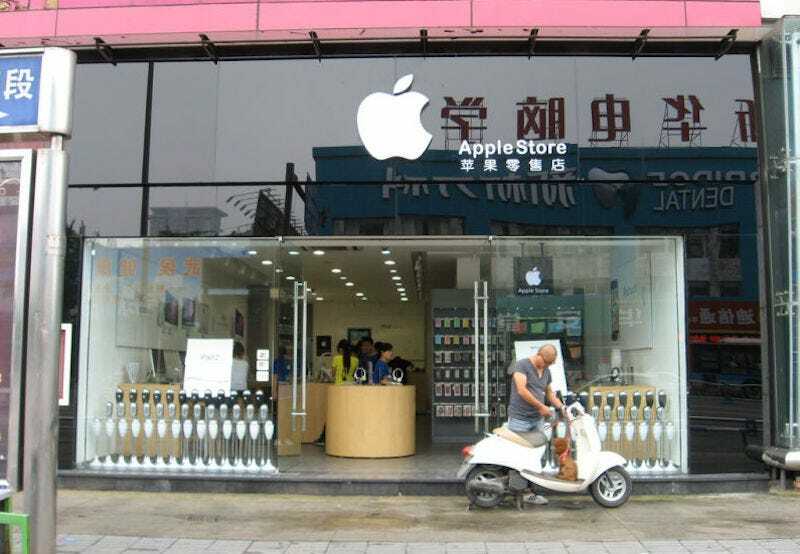 In particular, booming demand for Apple products in China, coupled with the relative dearth of actual Apple stores in the country, has spurred dozens of businesses selling iPhones, both real and knockoff, in stores that are made to look very much like Apple’s (very much trademarked) stores. According to Reuters, these stores are proliferating across Shenzhen (which has only one Apple store and five authorized dealers) ahead of the iPhone 6S’s release. Forget the phones, though: The stores themselves are the real star of the story. Unlike the fairly obvious Apple-like stores we’ve seen before, like the ones seen above in 2011 and below—in Johannesburg—in 2009, Reuters says these stores have employees dressed in Genius-style uniforms, Apple shopping bags, and furniture that looks like real thing. A faux-Apple store in Johannesburg in 2009. Image by Jeff Attaway/Flickr CC. It’s worth pointing out that the oft-repeated phrase “fake Apple store” is a little misleading at times. Not all stores are totally unauthorized, in some cases an authorized dealer strives to give its store that Apple-style aura to boost customer experience. We’re seeing Apple’s ethos leak into wider retail design, whether legal or not. Either way, soon these non-Apple stores may soon need to adapt: Apple is in the process of changing both its store designs and its employee uniforms. Lead image: An Apple retailer in Chengdu in 2011 by ChezShawna on Flickr.